Happy New Year!!! This is for all the folks that partied the night away, ringing in the new year sipping cocktails, champagne and shots. Maybe … just maybe, you had a few too many. I got you covered with a little ‘hair of the dog’ cure. 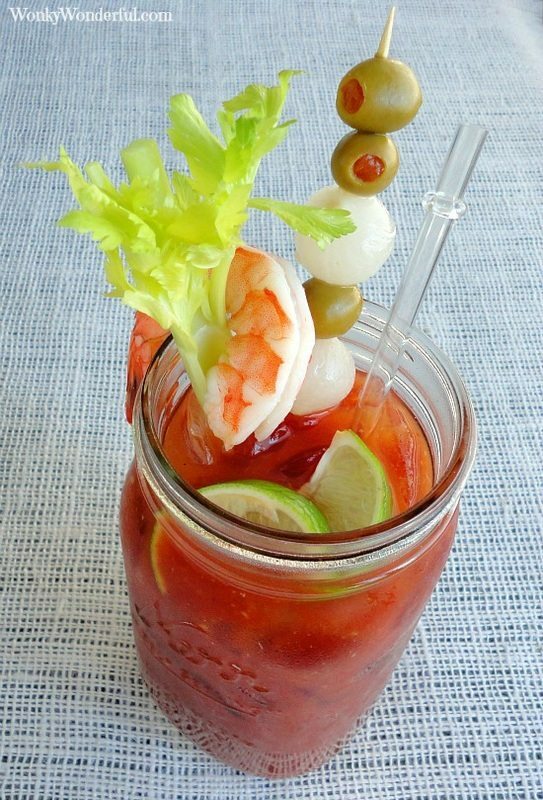 This Bloody Mary is cool and refreshing with some added spiciness to clear your head.So take a shower, drink a tall glass of water, eat a greasy breakfast, slap on your shades and make yourself a Bloody Mary with some zing. You will feel like new, or at least feel a little less like cat poo! Mix your favorite tomato juice (I used Low Sodium V8), worcestershire sauce, hot sauce (I used Frank’s Red Hot Original), horseradish, pepper, green olive juice, and lime juice in a large measuring cup or pitcher. Feel free to add more horseradish or hot sauce if you want more zip. I do not drink alcohol so I made myself a Virgin Mary. But, now would be the time to fill your glasses with ice and add the amount of vodka that you prefer. 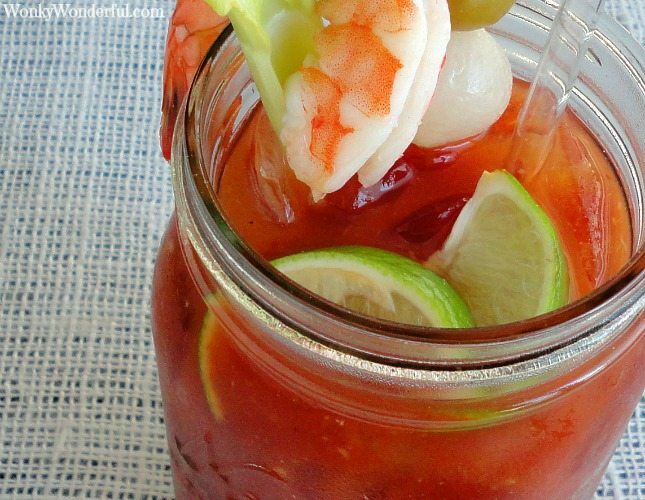 Then pour the Bloody Mary mixture into each glass and garnish however you like. I added a celery stalk, pearl onions, lime wedges, green olives and a shrimp. 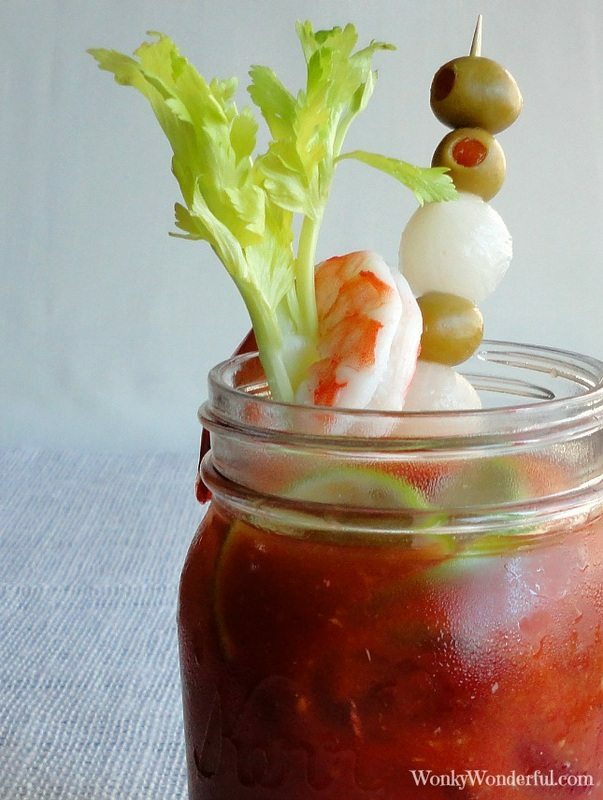 That is what I love about bloody mary’s, the garnish is like having a mini snack with your cocktail. Sip, Enjoy and Cheers to the New Year!